Precision Virtual Reality technology, created by the company Surgical Theater, arrived at the GW Hospital in April and gives doctors and their patients a view inside the body in 3D and in color. Virtual reality technology is now in use at GW Hospital, allowing neurosurgeons to digitally map out operations in advance of the procedure. Precision Virtual Reality technology, created by the company Surgical Theater, arrived at GW Hospital in April and gives doctors and their patients a view inside the body in 3D and in color. The technology helps patients understand their surgical procedures visually and improve outcomes on complicated operations, doctors at the hospital said. Precision VR works by entering MRI and CT scans of patients onto a computer software, creating a patient-specific model patients and doctors can view through a touch screen and a virtual reality headset, according to GW Hospital’s website. Susan Griffiths, a hospital spokeswoman, said the technology allows doctors to communicate more clearly with patients and provide them with more precise care. She added that the technology will help the hospital train the next generation of medical professionals. GW is the first hospital in the mid-Atlantic region to use this technology, Griffiths said. “This innovative visualization platform allows neurosurgery patients and their doctors to step into the patient’s diagnosis and walk together in 360-degree, reconstruction of the patient’s anatomy and pathology,” she said in an email. Griffiths declined to provide the cost of the technology and how the cost was covered. The technology is made of four different products, including a touch screen that allows doctors to test and display surgical procedures, educating patients and doctors on what surgery will entail, according to GW Hospital’s website. Doctors said the technology helps with pre-planning operations on patients and enables them to practice and perform procedures like removing tumors. Virtual reality techniques can lessen the chance of hitting major structures like blood vessels, which can cause severe health implications if they are ruptured during surgery. 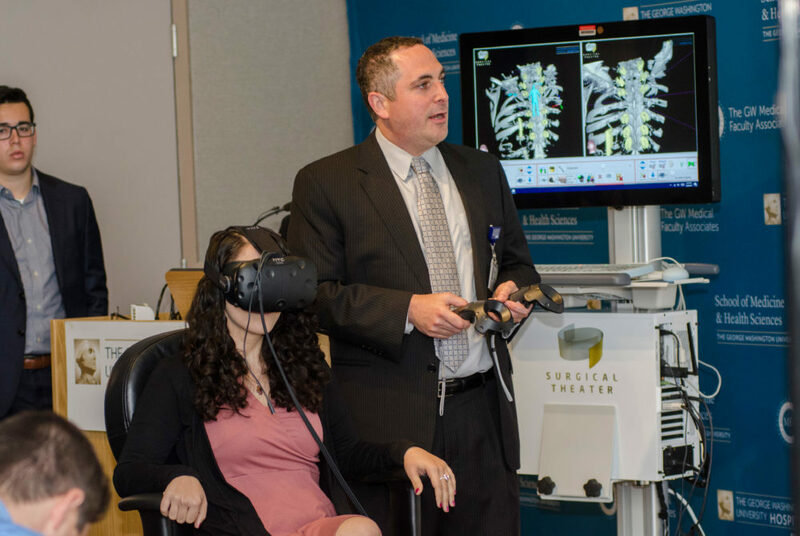 Jonathan Sherman, a neurosurgeon at the hospital, helped introduce Precision VR to the hospital as an improvement over MRIs and CT scans, which produce two dimensional images that doctors have traditionally used. Recently, virtual reality imaging allowed him to maneuver around a large vein-like structure when removing a tumor during surgery, he said. Sherman said the technology has generated buzz among patients because they can see and understand what he does during operations. He said the technology has allowed patients to ask more complex questions about how to complete the procedures and more clearly understand what needs to be done. “There was another patient that asked a question on how I was going to do something about protecting a blood vessel related to a tumor, and that would have been a question that would have never been asked before because they wouldn’t have even known to ask it,” Sherman said. Roodelyne Jean-Baptiste, one of Sherman’s patients, used the technology in May at a press conference after being diagnosed with two non-cancerous tumors in her brain that affected her vision. She said virtual reality helped Sherman map out exactly what he did in the previous surgery and why. Jean-Baptiste said she did not use the technology prior to her operation because her doctors had to move quickly. But after being introduced to virtual reality, she understood why her condition was serious. Although Precision VR is mainly used in the neurosurgery and neurology department of GW Hospital, the technology has been used by a doctor in the department of surgery. Paul Lin, the vice chairman of the department who specializes in the abdomen, said he used the technology to get a better sense of how involved tumors are in the intestines. Todd Goldberg, vice president of sales at Surgical Theater, said the technology was first used in hospitals in 2013 to improve surgery outcomes because the technology allowed doctors to plan out the procedure in advance. This article appeared in the June 12, 2017 issue of the Hatchet.